Buying an engagement ring can be a daunting experience. You can ask around and get all kinds of tips from your best friend, your mom and online. Another great resource is a family owned jewelry business that has been around a while. They have some very reliable advice, because they have seen a lot of engagement rings and talked to a lot of couples. Adolf Jewelers of Richmond, VA is one such jeweler. They have been in business for over 50 years and this family owned business has years of feedback to share with you. Here are a chosen few tips based on what our Coast Diamond Retailer of the Week, Adolf Jewelers has to say about buying an engagement ring. And keep your eyes open! Women with long fingers can easily wear bold ring styles. Extremely delicate settings tend to get lost on large hands, over-emphasizing their size and making the ring look smaller. A traditional 1Ct Coast Diamond solitaire engagement ring (LC5388RG) gets a fresh look when set in rose and white gold. The delicate cathedral setting boasts a peek-a-boo diamond under the center stone. How will the ring fit her lifestyle? Does she have a job where fussy jewelry would look out of place? Does she work a lot with her hands? Is she an outdoorsy type, or does she prefer a night out on the town? Lifestyle matters. A lot. This Coast Diamond halo engagement ring (LC6081-WC6081) is a classic style that is embellished with an engraved band; a simple and charming engagement ring that suits many lifestyles. Round is the #1 diamond shape chosen by most brides, but maybe not your bride. She might prefer an elongated marquise, an oval- or pear-shaped stone, or a square- or emerald-cut diamond. This Coast Diamond wedding set (LS10005-WS10005) is adorned with fishtail set diamonds. A center stone of any shape would look gorgeous in this ring. After you have gathered some information from the tips you have heard (more tips found here) take it to Adolf Jewelers, where they will “make you happy” when you find the Coast Diamond engagement ring of your bride’s dreams. Congratulations to Adolf Jewelers, Richmond, VA for being our Coast Diamond Retailer of the Week! Vintage – Antique – Aged like fine wine – Years of experience… Hear these words and it evokes great excitement in many of us. 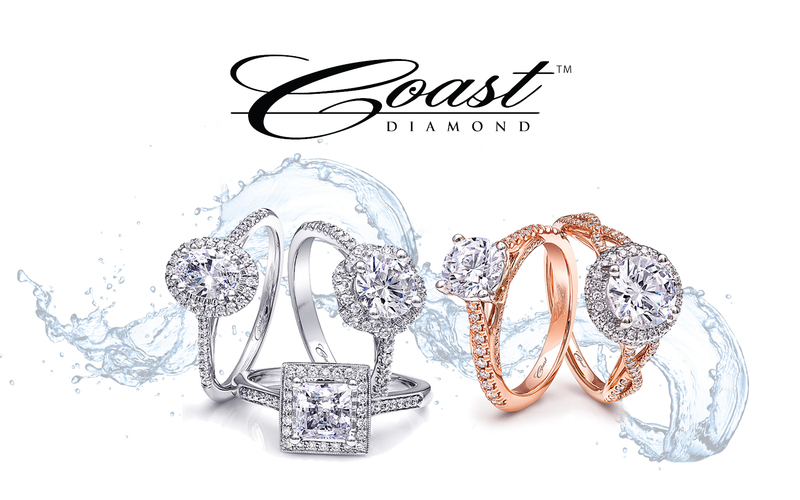 At Coast Diamond we love vintage and that is why each of our rings has a hint of vintage influence. At C.F Reuschlein Jewelers we can say they have lived vintage, even antique; their doors opened in 1891! It’s pure excitement to shop in their store and there is no better place to find a vintage engagement ring than with the help of their expert staff. For their 126 years of serving the community of Huntington, WV, Coast Diamond is thrilled to call C.F. Reuschlein Jewelers our Retailer of the Week. For the one you love on any occasion, engagement, anniversary or any such special day, this Coast Diamond 2.01CT pink tourmaline ring (LCK10288-PT) set in rose gold is any girls dream. As the modern day birthstone for those born in October and the official gemstone of the eighth anniversary, what a wonderful surprise to give the one you love such a gorgeous and thoughtful gift. The most customizable Coast Diamond vintage design is this petite halo engagement ring (LC5410). Choose the shape of the center stone; pear, oval, round, princess… and create a one-of-a-kind engagement ring that reflects your one-of-a-kind love. Make it even more unique with your choice of metal(s): rose, yellow or white gold, or platinum, or mix a couple for a truly creative design. The most classic of engagement ring design is the solitaire engagement ring. She will shout for joy when you ask for her hand in marriage with this Coast Diamond 2CT solitaire engagement ring (LC10020-WC10020) accented with intricately set diamonds on the band of the engagement ring and matching wedding band. The excitement begins at C.F. Reuschlein Jewelers as soon as you walk into their stunning showroom. You can find it a little easier by looking for the 20 foot tall Seth Thomas Clock set out in front of the store, as it has been for over 100 years. Congratulations to C.F. Reuschlein Jewelers in Huntington, WV for being our Coast Diamond Retailer of the Week , but even more impressive… being a staple in the Huntington community since 1891! With as much thought and value put into choosing an engagement ring, it becomes a treasure that can be passed down through the generations. An engagement ring is a family heirloom. There is a jewelry store in Rome, Georgia that has made it their goal for almost 60 years to help you give gifts that will last for generations. That store is Ford, Gittings & Kane Jewelers and we are thrilled to once again call them our Coast Diamond Retailer of the week. The most obvious display of family heirlooms is in the world of royalty. From tiaras to necklaces, bracelets to rings, there is no richer display of family heritage in diamonds and gemstones on earth. When a prince or princess gets engaged it is almost always with an engagement ring created using the diamonds and gemstones of generations before them. Queen Elizabeth II’s engagement ring was commissioned in 1947 by Prince Philip using the diamonds from his mother’s (Greece’s Princess Alice) tiara. This Coast Diamond hand-engraved cushion shaped halo engagement ring (LC6061) is the perfect marriage of vintage and modern. Its band resembles that of Queen Elizabeth’s engagement ring with the width of the band being wider at the center stone. Princess Diana’s engagement ring created quite a scandal because it was not custom-made as was typical of the royal family. Rather Princess Diana chose her ring from the royal jeweler’s retail collection. Today it is worn by her daughter-in-law, Kate Middleton. Fit for a princess, the Coast Diamond 3.35CT unheated sapphire halo engagement ring (LSK10082-S) is surrounded by 1CT of diamonds and set in platinum. For the royalty in your life Coast Diamond suggests the Coast Diamond petite two-tone halo engagement ring (LC5403RG). The 1CT diamond center stone has a double prong setting and halo of white gold. It is finished with diamonds decorating the band of rose gold. The matching rose gold diamond band (WC5403RG) is the perfect complement and makes this a wedding set to pass down through generations. Congratulations to Ford, Gittings & Kane Jewelers of Rome, GA for being our Coast Diamond Retailer of the Week! Grand is 2017 and grand is The Vault Fine Jewelers in Fresno, CA. Located in the Fig Garden Village Shopping Center, The Vault offers an upscale shopping experience perfect for the occasion of choosing your dream engagement ring. If grand is what you dream of then The Vault is where you will find it. AND they offer a couple searching for their dream engagement ring so much more… They are the leader in the valley in customer service and do it with unsurpassed integrity. Coast Diamond is proud to call The Vault Fine Jewelers our Coast Retailer of the Week. Glamour and opulence are the trends of 2017. How does that translate to your Coast Diamond engagement ring? Unique halo engagement ring styles are 2017 grand. The halo engagement ring is a classic, but to bring it up to glamorous this Coast Diamond halo engagement ring (LC10130) has a double halo of diamonds around the 1.25CT center stone, and a cathedral setting encrusted with diamonds. It is grand from any angle. Pear shaped engagement ring styles are 2017 grand. Who sets the rules? This Coast Diamond pear shaped engagement ring (LC5410-PRS) says you do. Our most popular engagement ring style is amped up with an opulent 1 CT pear shaped diamond center stone. Scalloped engagement rings are 2017 grand. The opulence of Hollywood is channeled into this Coast Diamond wedding set (LS10006_WS10006). A 1CT solitaire diamond center stone accented by scalloped bands of fishtail set diamonds… Pure glamour. Grand congratulations to The Vault Fine Jewelers of Fresno, Ca for being our Coast Diamond Retailer of the Week!